Paper products 100% biodegradable and compostable. TreeFree food service containers, tissue paper, toilet paper, paper towels, utensils, plates, bowls shopping bags. Saving trees everyday and reducing the amount of plastic going into the landfills. World Centric products are some of the highest quality compostable products in the market. They are created with renewable resources, such as sugarcane, reed, corn, and potato starch. Their product line consists of biodegradable & compostable plates, bowls, cups, cutlery, containers, and clamshells. 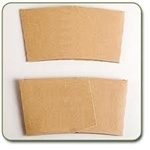 100% post consumer hot paper cup sleeves for 10- 20-oz cups . Compostable paper cup sleeves, no double cupping reduces waste. US Eco Products, Corporation is available to answer your questions at 978-457-9229. We strive to provide the best available compostable and biodegradable food service products.